Turn a standard closet into an organized space with these DIY plywood closet organizer built plans. 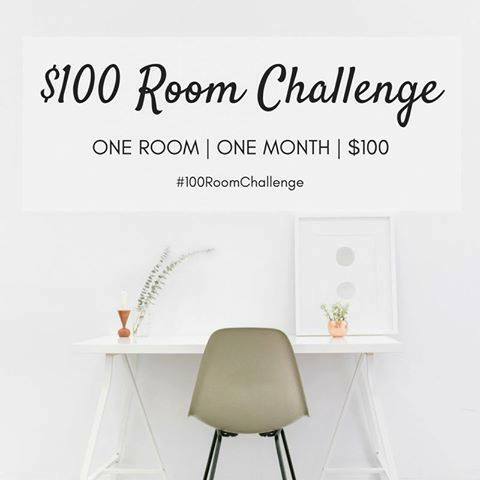 It’s week 3 of the $100 Room Challenge and I am feeling the pressure. There is still so much I want to do for our custom closet makeover, but time and money are running out fast! I guess I thought a closet makeover for $100 was going to be easy, well I was wrong. But it’s not going to be impossible. 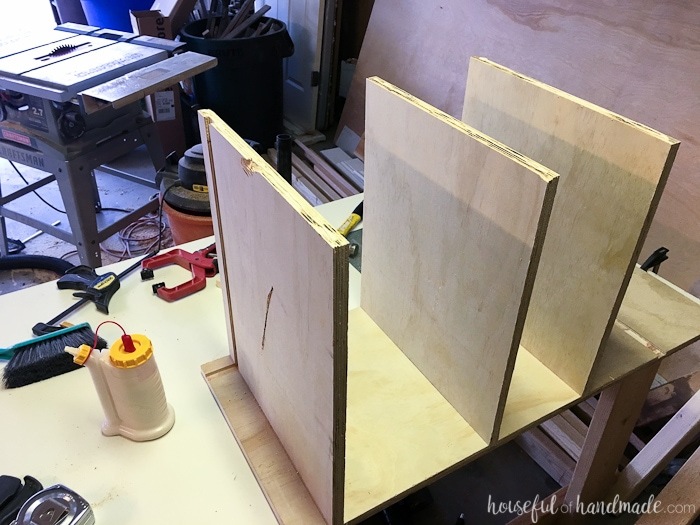 And if I had another week, I wouldn’t be stressing at all about this DIY plywood closet organizer. 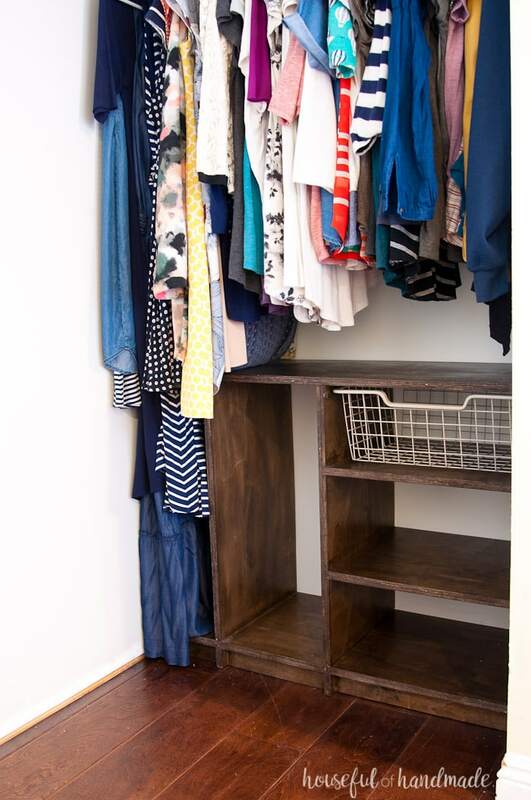 The majority of our custom closet makeover was to create lots of organization with a plywood closet organizer system. I was sick of just having hang bars to store all out clothes. I never thought I would want shelves and baskets so much. But that is exactly what I wanted for our new organized closet. When I built our old closet (while 9 months pregnant with our first baby), I thought I wanted lots and lots of space to hang piles of clothes. I guess that’s because I had a ridiculous amount of clothing. That is what happens when you’ve worked in retail for 10 years. But now as I am slimming down my wardrobe (I’m not quite to a capsule wardrobe, but now I see the appeal), I want to be able to see the clothes I have and store them properly. Did you know you are not suppose to hang knit clothing? Most of my clothing is knit! I love the comfort when working on projects, but hanging it can stretch out. I still hang blouses and tops, but decided it was time to stop hanging my sweaters. No more shoulder bumps for me! So armed with 2 sheets of 3/4″ plywood, I set out to create two custom closet organization systems. Why 2 sheets of plywood? Because that is all my $100 budget could afford! 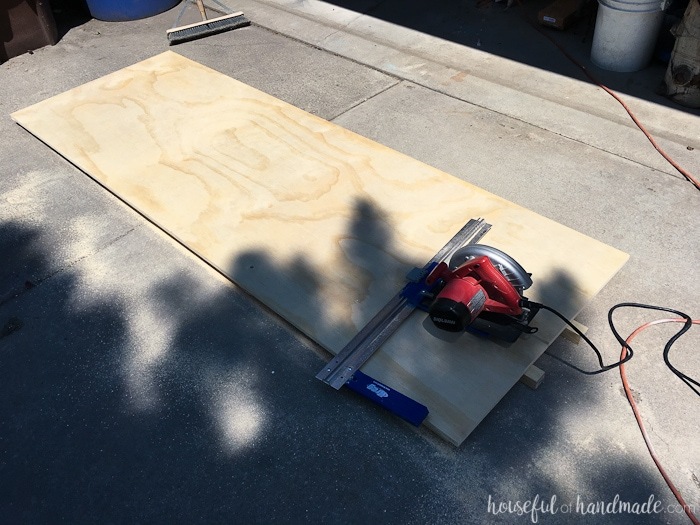 I used pine plywood that I found at the Home Depot for $35 for a 4’x8′ sheet. That only leaves me with $30 for any other items needed to finish this entire closet (good thing it’s kinda small). But the result is already so much better than it was before! Instead of a cramped closet with lots of hidden corners, we have an open walk in space that you can even get dressed in. Instead of non-functional shelving and wasted space, we have beautiful shelves with designated spaces for everything (and room for more). 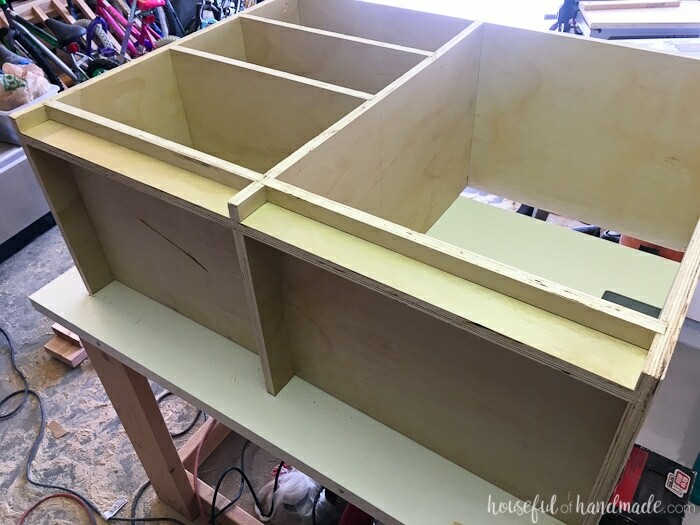 To finish off our plywood closet organizers, I still need to add the pull out pants racks (this is the part my husband is so excited about) and find boxes to cover to add to some of the shelves. I have already discovered a few that fit perfectly into the spaces! And then I need to figure out the best way to organize our piles of shoes without taking up the beautiful open space we are both loving. 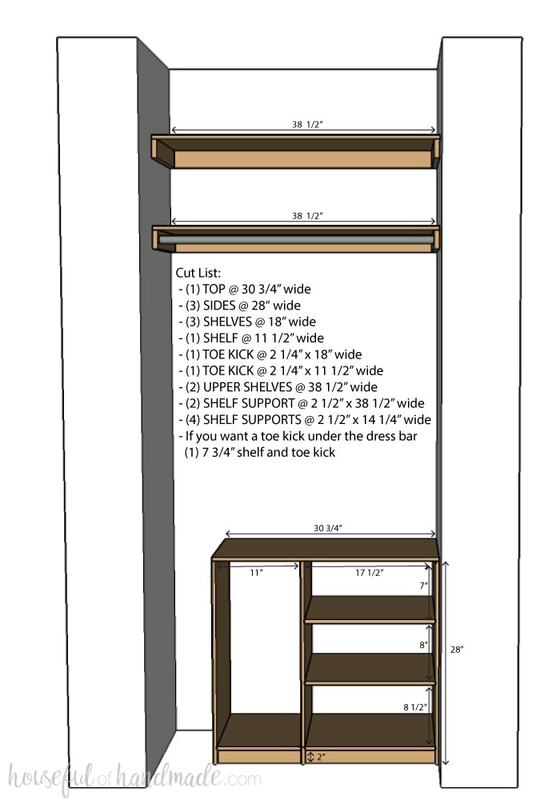 Before we get into the tutorial for the DIY Plywood Closet Organizer Build Plans, I want to share how we are doing so far with the budget. It’s a little scary since I know I want to add so much more to the space. Boxes = gotta love ordering online! But enough of that, let’s get on with the building! Click the arrow below for the tutorial. 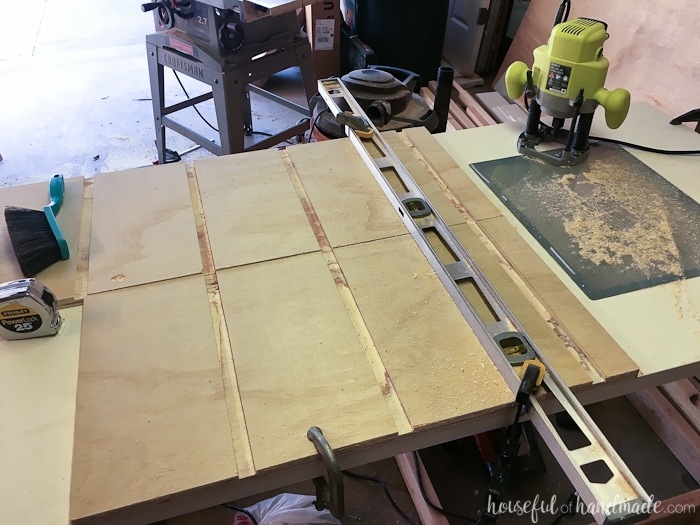 I used 4 6″ clamps to hold the boards while routering and a 24″ clamp to clamp the cabinet while glueing. A larger clamp could have been useful too but not necessary. I recommend having as many clamps as you can afford because they make life so much easier! 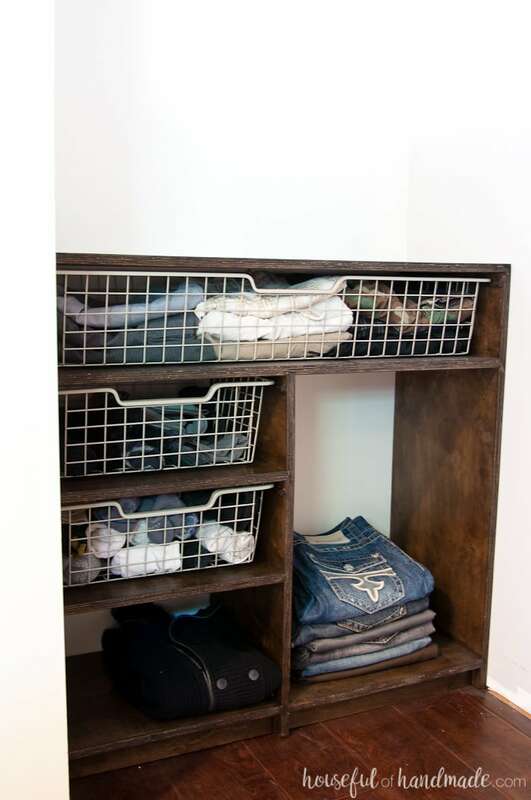 We used old Ikea Pax wardrobe baskets that were already in our closet (measuring 17 1/2″ wide, 7″ tall and 13 1/4″ deep). Any basket will work, just adjust your shelving to fit as needed. I used Minwax Jacobean and love the dark wood. It makes the closet look expensive. 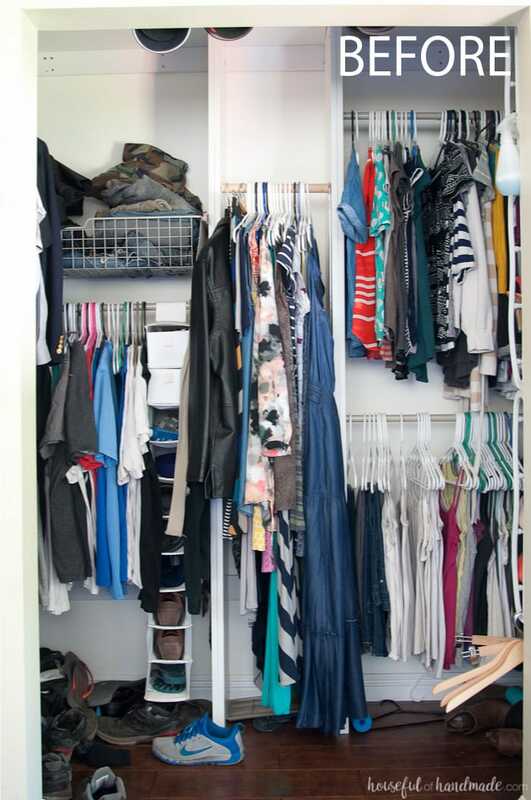 Each of these closet organizers fills a 38 1/2″ closet area. If your closet is bigger, you could easily add more shelves to one side or hang bar. 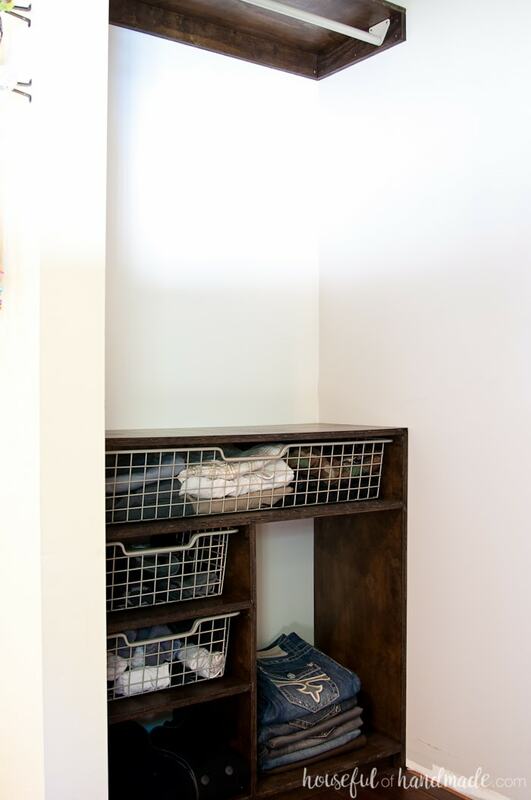 Feel free to use these ideas to figure out your own custom plywood closet organizer! 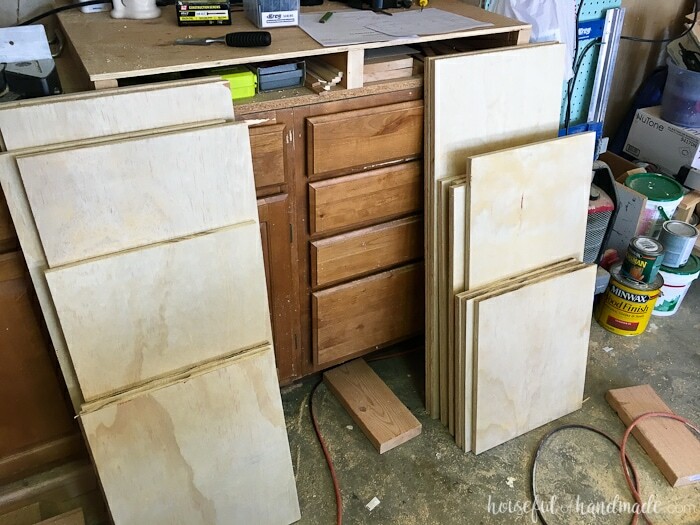 Cut the plywood down to 15″ x 8′ boards. I used my circular saw and Kreg Rip Cut to do this (so much easier than trying to cut large sheets of plywood on a table saw), but you can also have them cut at the home improvement store. Don’t throw away the approximately 2 1/2″ end piece, it is needed for the plans. 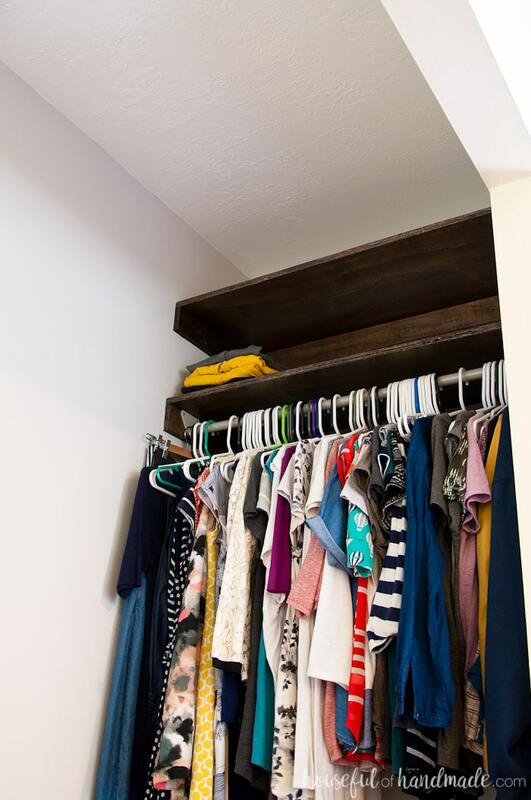 Cut the 15″ wide boards down into the widths needed for each closet organizer. Make sure you are careful not to waste any pieces by always cutting the largest piece possible from any left over boards. 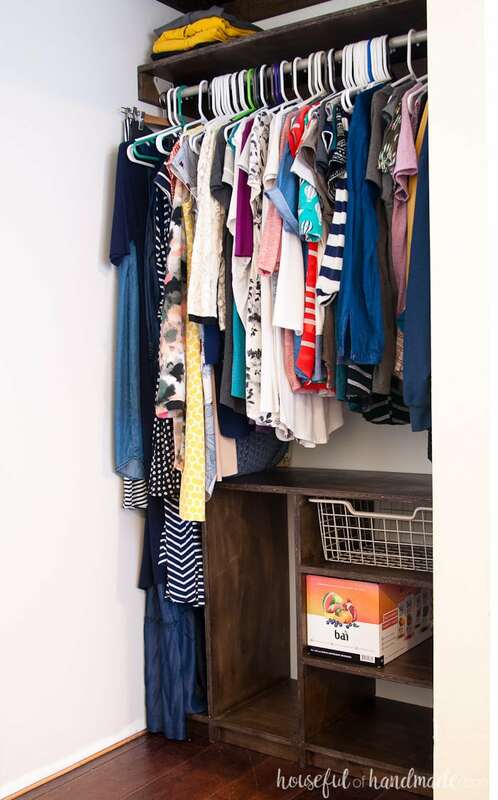 You will have a little wiggle room (but not much) if creating these closets exactly. 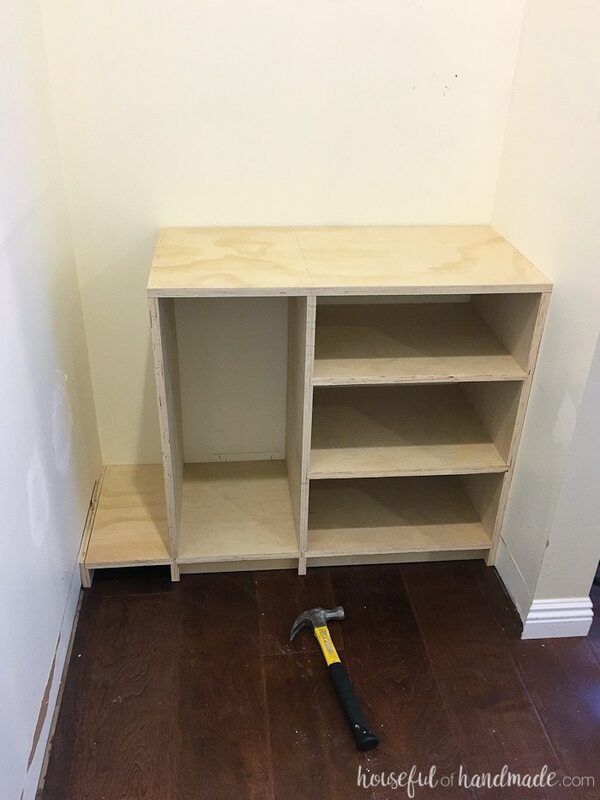 If you are customizing your own plywood closet organizer, add 1/2″ to any shelves to allow them to sit inside the routered dados. 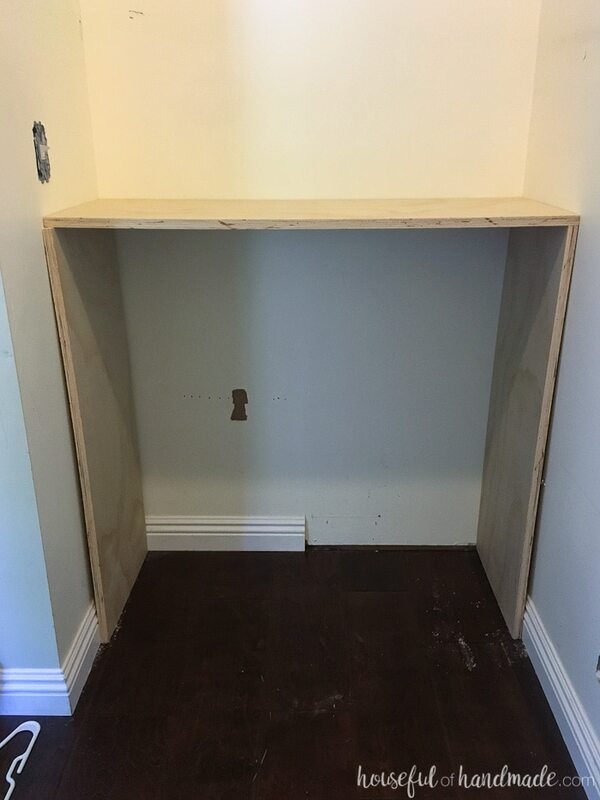 Since my cabinet is going to fill the entire closet space, I did a dry fit to make sure the measurements were correct. This saves a lot of headache in the long run. However, for the other side of the closet, even thought I did a dry fit, I discovered an issue. Since the cabinet was not filling the entire space (I needed room for long dresses to hang), I built the entire cabinet. Then I wanted to add a toe kick and bottom shelf to go under the dresses to keep the dust and dog hair away from my clothing. I put the cabinet in the space then dry fit the toe kick piece. It worked so I assembled it. Later I learned that the closet curved a little bit at the front, so the cabinet could not slide into the space assembled (I’ll share how I fixed it later). So double check that when dry fitting as well. Using the router, cut 1/4″ deep grooves into the sides of the boards where your shelves will sit (this is called a dado). I don’t have a 3/4″ dado router bit so I measured out where the 3/4″ dado needed to be. Then I used the 1/2″ bit and went down each edge of the 3/4″ opening. It wasn’t perfect, but saved me the $20 to buy the bit I needed. I’ll probably invest in it later if I see myself making lots more cabinets (like in our kitchen maybe). 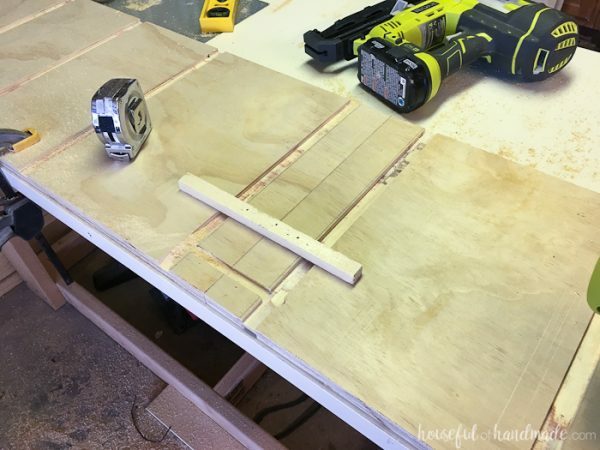 Clamp the two side boards next to each other before you router the dado so the router line is identical for each side of the shelf. 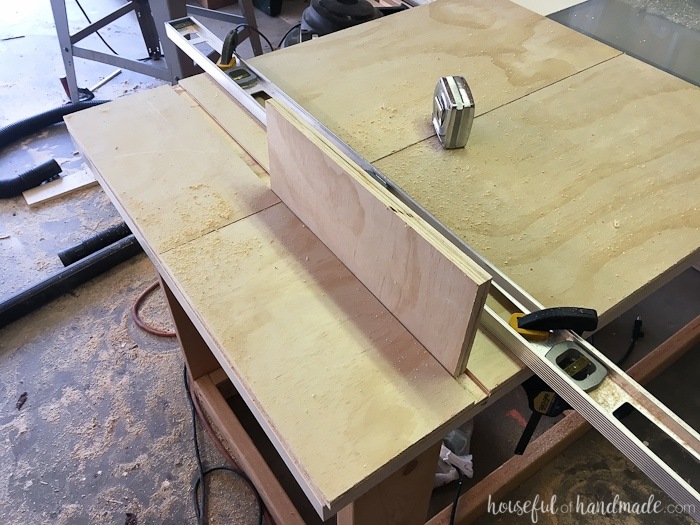 If you do not have a fancy routing table (it’s on my wish list too), clamp a straight edge like a level to the board so that you can router a straight line. I measured the distance the straight edge needed to be from my line based on the edge of the router bit to the edge of the router. For the bottom of the cabinet, I added a toe kick to keep dust and dog hair from finding a place to hide. 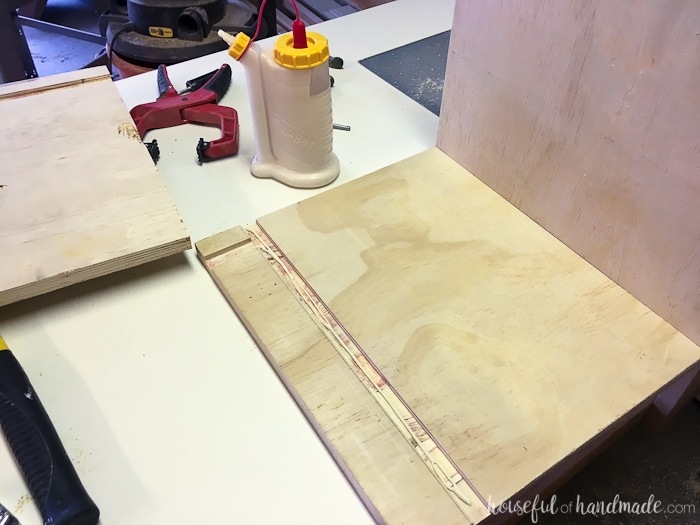 To do this router your dado 2″ up from the bottom of the cabinet (for the bottom shelf), then router another dado 1″ in from the front of the cabinet from the bottom of the board to the bottom shelf dado. Instead of clamping a level to router this piece, I found it was easier to nail a scrap piece of wood to the boards. These nail holes were positioned to be hidden inside the toe kick. For the boards up the center of the closet, you will need to router the dados on both sides to correspond with the shelf layout. Once all the dados are cut into the sides of the cabinets, it’s time to assemble. This part goes really quickly with the prep work that has already been done! Add a healthy amount of wood glue to the inside of the dados and then place the shelf inside it. 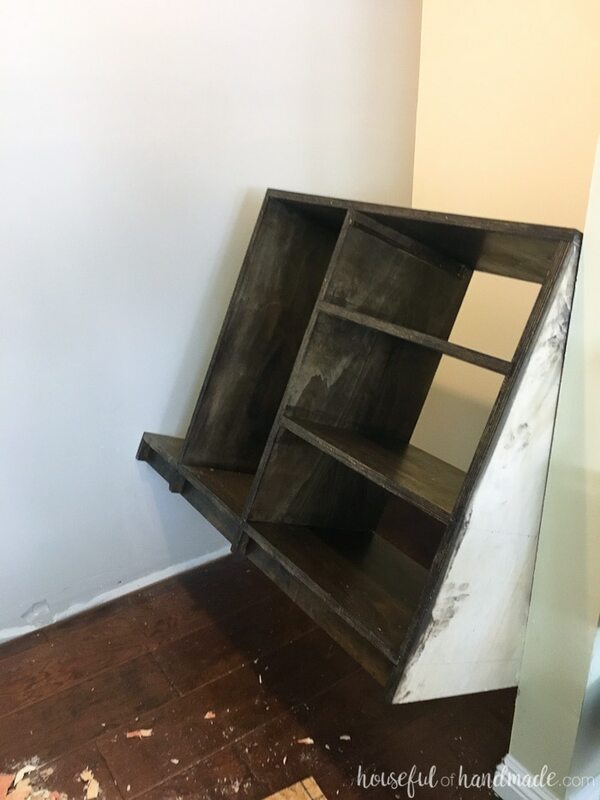 Add all the shelf pieces to the side before adding the top piece. Add glue to the edges of the boards then lay the other side piece on top like a puzzle. It may take a little maneuvering to get them all to slide into their dados. 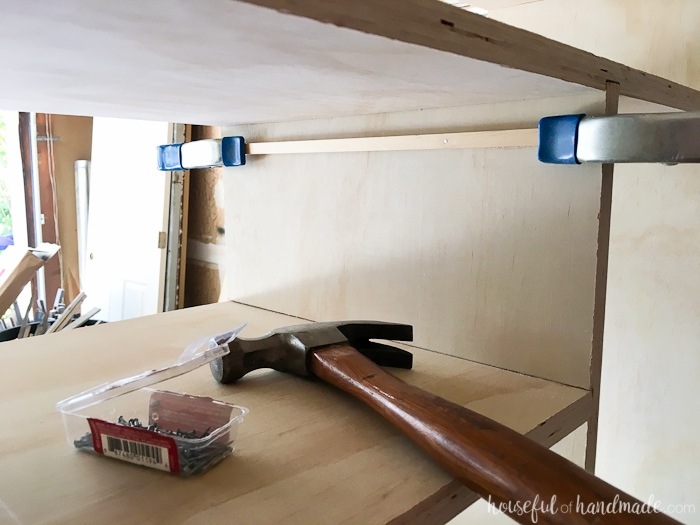 Clamp the cabinet and secure the shelves with a few 1 1/4″ nails into the ends. Make a straight line across the outside of the shelf area to make sure your nails go into the shelf straight and don’t stick out into your cabinet. 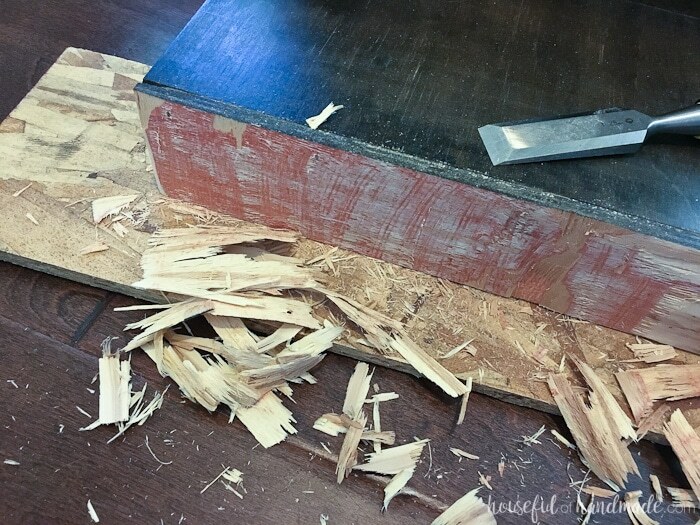 To add the toe kick, rip the left over piece of plywood to 2 1/4″ wide. Then cut to the same width as the shelf above it. Add wood glue to the dados and slide the toe kick into the area. Clamp until dry. I only used a couple nails to secure this piece because it isn’t going to be able to move once the cabinet is standing on it. You can stop here and use boxes or just leave these beautiful shelves to hold all your clothing, but I wanted to use the Ikea baskets that we had in our previous closet so I added some ledges for them to slide on. Cut the 3/8″ square dowels to the depth of your basket. 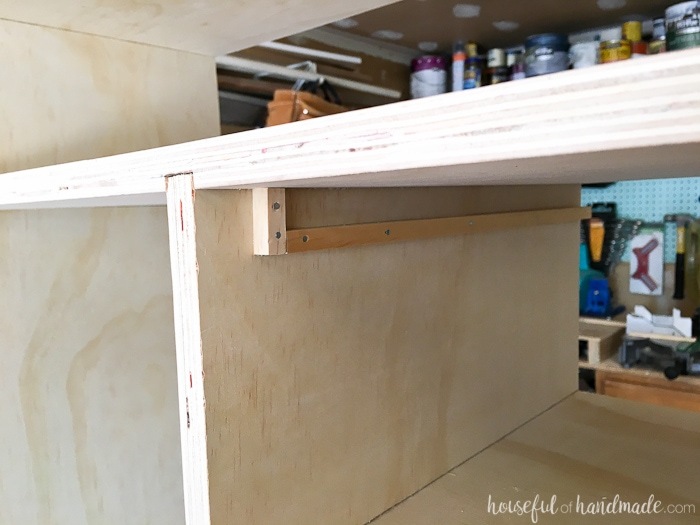 Put wood glue on the back of it and then secure it to the front of the drawer 3/4″ down from the top. I used clamps to help hold it in place while I hand nailed in 5/8″ finishing nails. Then cut another small piece of the dowel to add to the back. This keeps the basket from sliding all the way to the back of the cabinet. 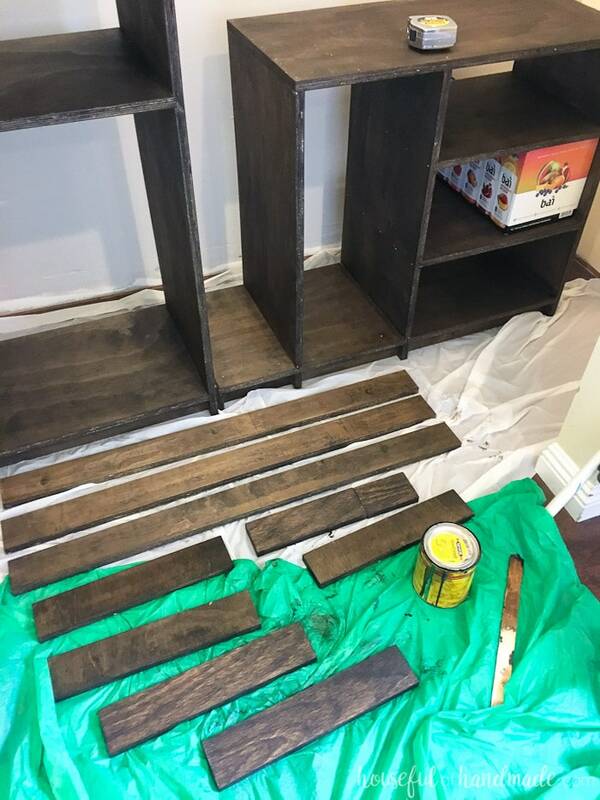 It’s time to sand, stain and seal the finished closet organizer. I chose to leave the edges of the plywood uncovered because I like the look of the layered plywood. It’s a little bit industrial. But if you do not, you can always cover with iron on banding or wood strips ripped to 3/4″ x 1/4″. 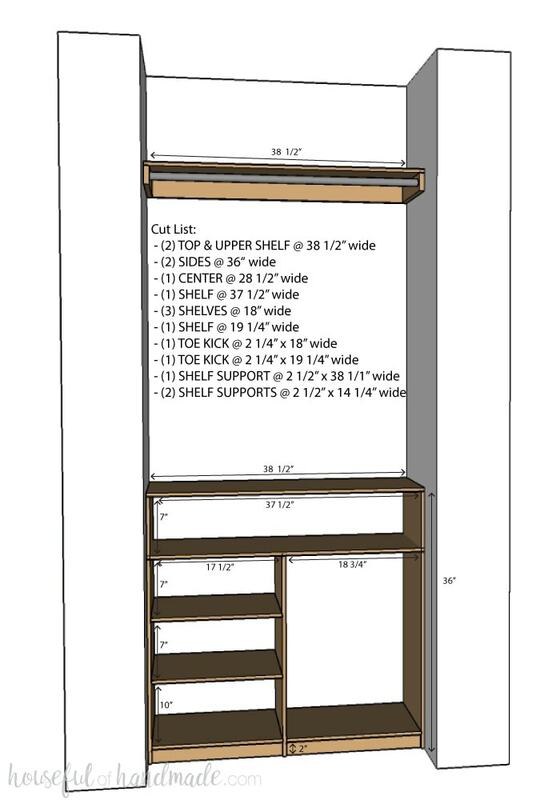 Now if you are lucky and measured and dry fit properly, you can slide those cabinets right into your closet! If you don’t have a level floor, you can use wood shims to level the plywood closet organizer system. If you are not as lucky, like my side of the closet, you will need to shave off some of the plywood to get it to fit. I chose to shave off the toe kick platform that goes under my dresses. After trying to just sand off enough to get it to fit (no luck), I used a wood chisel and was able to shave off a couple layers of the plywood. Then I measured the closet area to find the largest part (where the wall doesn’t curve in 1/2″), and lifted the cabinet into that space. Using a scrap piece of wood to protect the edge of my cabinet, I tapped the cabinet into the closet with a hammer. Go back and forth on each side so it slowly moves into the space without getting lodged into one side. I secured the cabinets with a few nails into the wall studs, but they are pretty secure and didn’t really need a lot of securing. Then it was on to the shelves above! 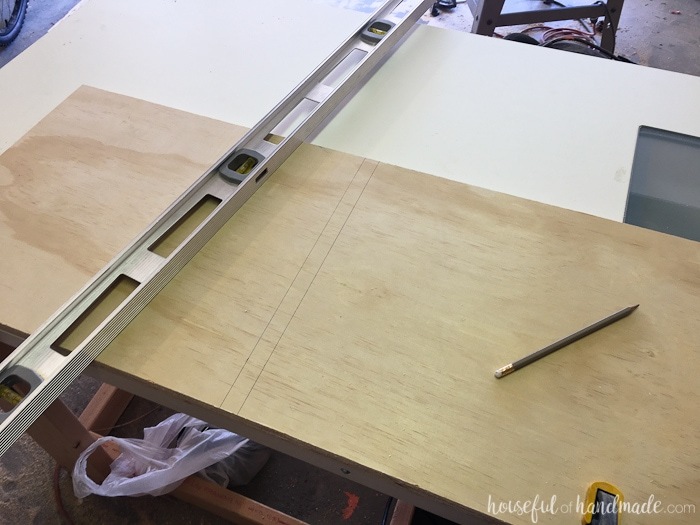 Using the remainder of the approximately 2 1/2″ left over strips of plywood, cut a piece the width of the closet for the back of the shelf support. Then cut 2 more pieces 14 1/4″ for the side supports. 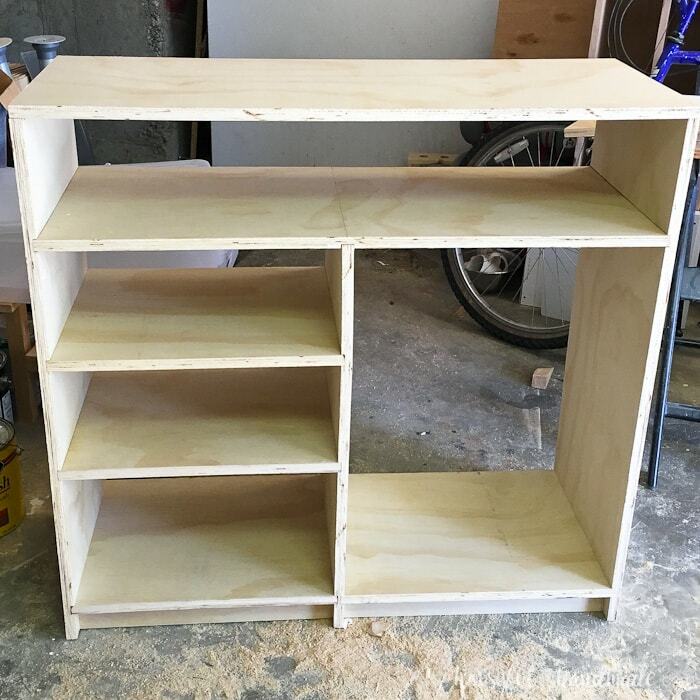 I didn’t have enough left over plywood to support all 3 shelves, so I had to use some scrap wood for 3 pieces of side support. Sand and stain these boards. 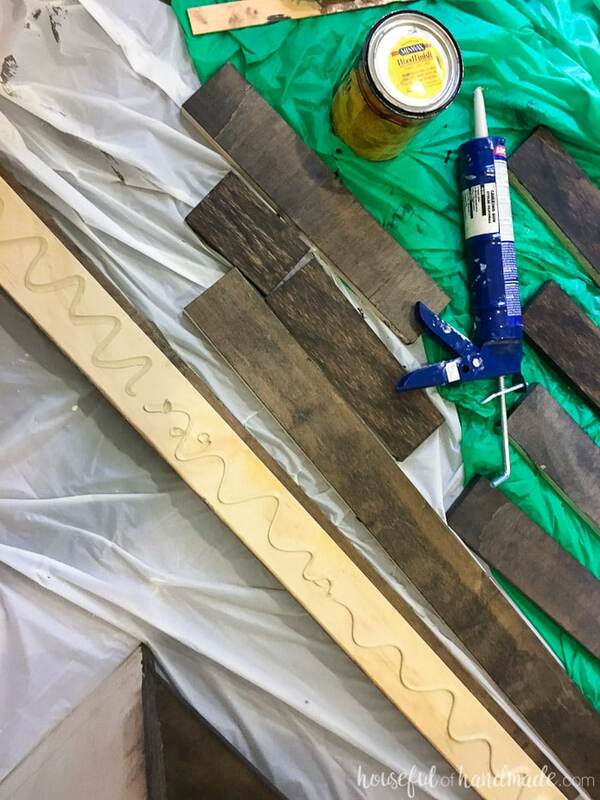 Add a bead of construction adhesive (AKA liquid nails) to the back of the board then attach it to the wall with 2 1/2″ nails. 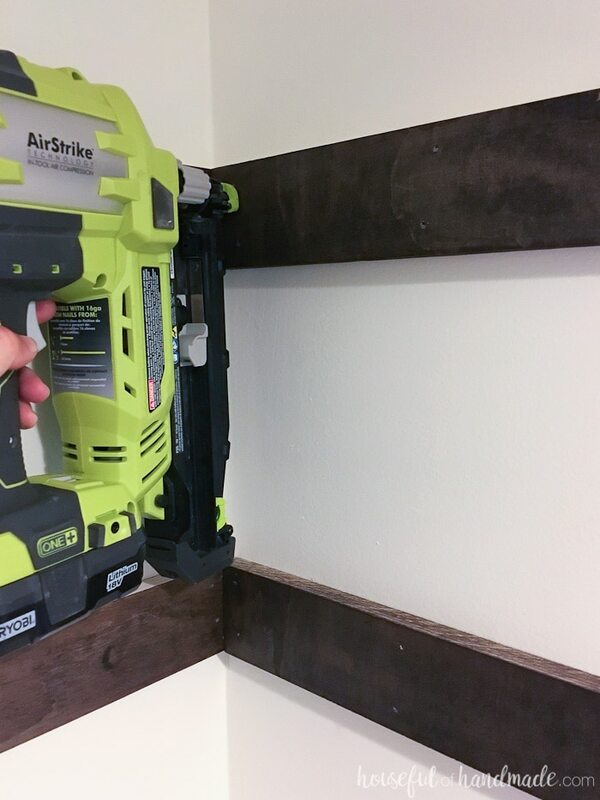 Use a level to make sure your shelves are nice and level. Attach the back boards first them secure your side boards in front of them. Try to get the nails into as many studs as you can, but the construction adhesive will help keep these boards secure once cured. And unless you put a ridiculous amount of weight on them (which I am not going to be doing since they are in my clothes closet), they will be very sturdy. Cut your 15″ plywood boards to fit on top of your shelf supports. Dry fit them to make sure they fit. Then sand and stain and lay them on top of the supports. Secure them to the supports with a few 1 1/4″ nails in the back. Then seal the shelves with a couple coats of polyurethane and you are ready to go! Add a hang bar to the shelf supports (this will allow you to secure the hang bar without needing to go into a stud). I used a pipe cutter to cut the hang bars from our old closet to fit (they were about 1/2″ too big). And then start loading the closet up! I can’t believe how much space I have! It looks so much smaller, but because of the function and no hidden corners, everything fits so much better. I really wish I had done this earlier. Such a transformation already and we are not done yet! Stay tuned as I finish this remodel for next week (hopefully). And don’t forget to check out these other amazing $100 budget makeovers. And don’t forget to follow-along with all these other awesome bloggers as they redo a room for only $100 too! Beautiful organizer! This space is look fabulous already! Looking forward to the big reveal! It looks so much better already! Storage solutions make me so happy! Storage solutions make me happy too! Sorry for being late to post and read your post. Just finished the third week still need to do 4th. This is a great DIY for my room above the garage. Thanks for the inspiration. I needed something like this to get ideas. I’m so glad it will work for you. Thank you Maria! Your organizer turned out awesome!!!! I can’t wait to see the final reveal next week! The organizer is gorgeous! I always think little spaces can be done without spending much… then I start working and realize small spaces can cost a whole lot more than I thought 🙂 Can’t wait to see the reveal next week. I’m just really hoping I can get away with doing it all for under $100. Wish me luck! Your closet is looking great! I love the storage rack you built; it looks awesome! Thanks so much Jenny! I love the rack too.